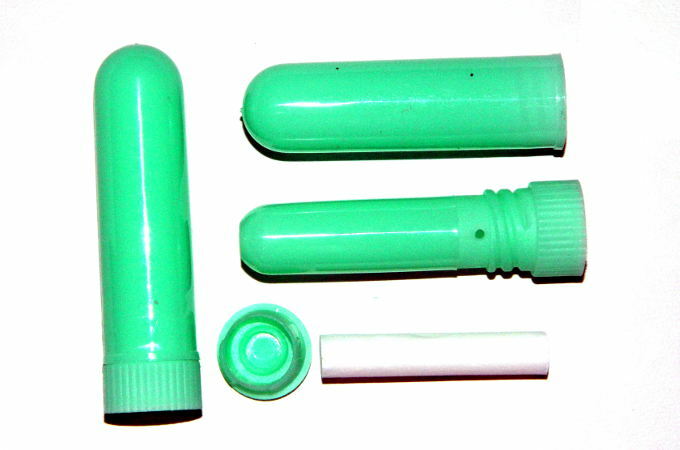 These nasal inhalers are a perfect way to enjoy the benefits of essential oils and blends.ï¿½ They are convenient and personal.ï¿½ Ideal for head clearing blends or try calming blends (a great companion when in stressful situations) or even stimulating blends (when you need a little ï¿½wake-upï¿½).ï¿½ The green colour is ideal for herbal, uplifting and head clearing blends. To use, simply add up to 15 drops of your chosen oil/blend to the cotton wadding, place in the cavity and snap on the cap.ï¿½ They come complete with an outer, screw-on shell (to keep the inhaler clean and ideal for labelling). To be used with therapeutic essential oils only.ï¿½ Fragrance oils are not recommended.